In this day and age, you can do almost anything with the help of your trusty iPhone, iPod, or iPad. Why should planning a wedding be the exception? Fortunately, there are plenty of apps to help you make sure that your special day is everything you want it to be. When you’re looking to get organized, find local vendors, or get wedding day inspiration, you can turn to your iPhone to find the help that you need. High-profile names in the wedding industry such as wedding planner Mindy Weiss and bridal media such as “The Knot” and “Brides” have developed apps to offer their expertise to tech-savvy brides. “Plan Your Wedding with Mindy Weiss” is the signature wedding application from celebrity wedding planner, Mindy Weiss. At 9.99, the app is on the expensive side as far as digital planning tools go. However, its vast array of features may be worth the price for you. Like many other wedding apps, this app allows you to search a database of wedding gowns and manage vendors. However, in addition to these standard features, “Plan Your Wedding” provides you with video advice from Mindy herself as well as a “dreamboard” where you can save wedding inspiration photos, a budget management tool, and a section for keeping track of your gift registries, guest lists, and thank you notes. Wedding mega-resource, “The Knot,” offers a number of free application options to help you with your wedding planning. For iPhone users, “Wedding Dress Lookbook” allows you to search for the perfect gown by inputting your height, body type, personality, and wedding style in addition to other search terms. “The Knot” also offers “Wedding 911,” an app in which brides submit their questions about etiquette, receptions, ceremonies, saving money, and other wedding day details. For iPad users, “The Knot” offers a great digital edition of its magazine at $4.99 an issue, complete with a spot for saving inspiration and plenty of videos to help you create D-I-Y invites and favors. Another free app option is “BRIDES Wedding Genius,” straight from the pros at Condé Nast’s “Brides” magazine. This app allows you to explore a huge database of wedding dresses, his and hers jewelry, and travel destinations for your dream honeymoon. For a few dollars, you can upgrade this application to the “BRIDES Digital Wedding Binder,” which allows you access to expert advice, inspiration folders, and a spot to manage your wedding to-do list. 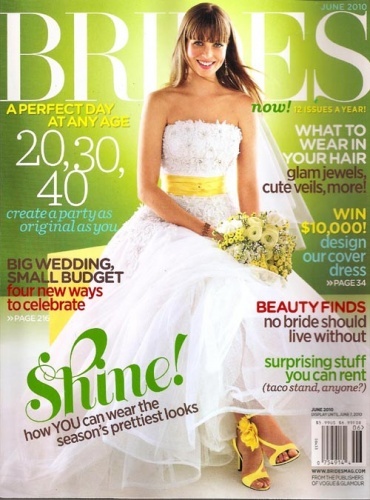 As an avid lover of all things bridal, I love to keep up with my wedding magazines. 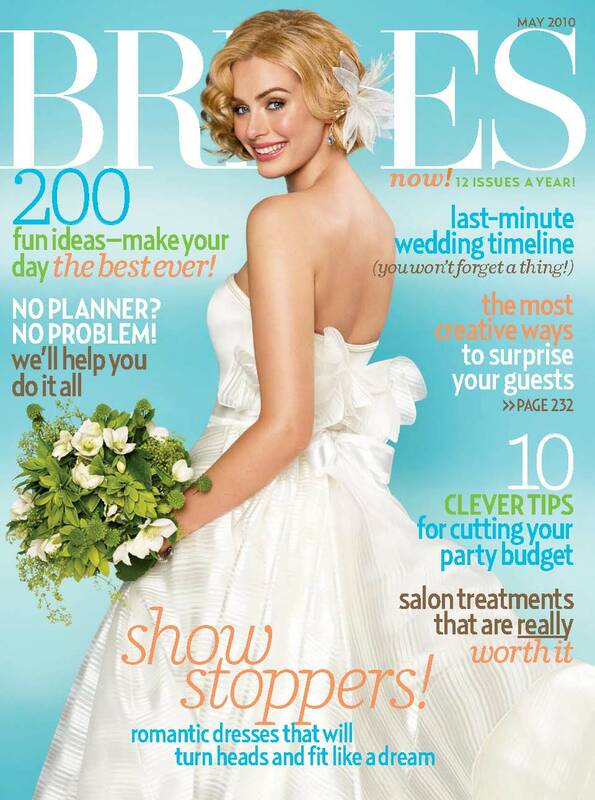 Condé Nast‘s Brides is one of my personal favorites. 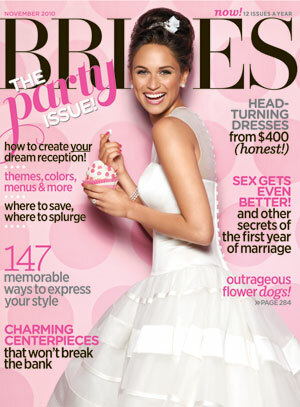 To ring in the new year, I’m looking back at the 2010 Brides covers and choosing my favorites. #1: My favorite cover of the year! November's cover was fun and flirty. From the Breakfast at Tiffany's inspired bride to the polkadot backdrop to the cute cupcake, everything fit perfectly. #2: My second pick from the month of June was a fresh way to kick off the summer months. The pops of yellow in the bride's ensemble are lovely touches for a spring/summer ceremony. #3: October's cover was retro and fun. It was great to see a groom join the shot, making this the only Brides cover for 2010 with more than one person on it. Honorable mention: Though not in my top three covers for the year, the May cover definitely deserves a nod. The fair bride and her all white ensemble pop beautifully against the Tiffany blue backdrop making for a feminine, elegant cover. I can’t wait to see what Brides has in store for us in 2011! You never know what you’ll find when looking through the classifieds section of a magazine. 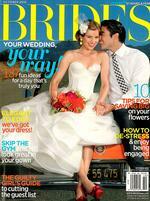 Brides Magazine’s “Best Bets” section is one of my favorite classifieds sections. Full of quirky wedding favors, invitation ideas, and all sorts of personalized items, “Best Bets” of course has its tackier choices (e.g. trampy rhinestone-adorned platform flip-flops), but, it also has a number of hidden gems. One of my favorites from the “Best Bets” vault? Guestbook Store. Guestbookstore.com offers guestbooks for all occasions; from baby showers to anniversaries to graduations. Most notably, in my mind, are their offerings for weddings. Guestbooks are a great way to add a personal touch to your wedding celebration and provide you with a souvenir to look back upon for years to come. Additionally, Guestbook Store offers two different page designs: predictions, which asks guests to take bets on things like when the couple will have their first child, and memories, which asks guests to discuss their favorite memory of the wedding celebration. Different pages are also available based upon the mood of a wedding: formal or casual. My suggestion for encouraging attendees to participate in filling out a guestbook page would be to distribute the pages with dessert. When relaxing over a warm beverage and a slice of cake during this low-key part of the reception, guests are more likely to provide thoughtful responses. To make this even more personal, provide a selection of colored markers and perhaps some cute stickers to allow guests to further express themselves and their personal style. It’ll provide for wedding memories that you’ll always cherish.